writing for older women. There are some actresses who have production companies and create their own material, and I truly admire that. 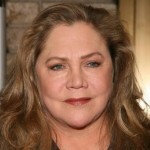 Mary Kathleen Turner, better known as Kathleen Turner, is an American film and stage actress and director. Turner came to fame during the 1980s, after roles in Body Heat, Romancing the Stone, and Prizzi's Honor, the latter two earning her a Golden Globe Award for Best Actress. In the later 1980s and early 1990s, Turner had roles in The Accidental Tourist, The War of the Roses, Serial Mom and Peggy Sue Got Married, for which she was nominated for the Academy Award for Best Actress.